Letter from Chancellor Nicholas S. Zeppos and 48 of his colleagues calling on congressional leadership to modify or eliminate the endowment/net investment income tax enacted as part of H.R. 1, the Tax Cuts and Jobs Act. “The tax bill passed by Congress today rightly excludes draconian proposals that would have made college more expensive for students and families. In particular, we appreciate that Sen. Lamar Alexander recognized the negative impact specific provisions would have on the mission of higher education and worked to mitigate that impact. “But this legislation still falls short in other ways. It needlessly undercuts the resources universities need to operate. And that means it undermines our country’s competitiveness, national security, and economic growth. “Though it only currently affects a handful of universities, the 1.4 percent excise tax on certain university endowments is fundamentally bad public policy. It is an unprecedented government intrusion and taxation of tax-exempt universities that will result in fewer resources for student financial aid. 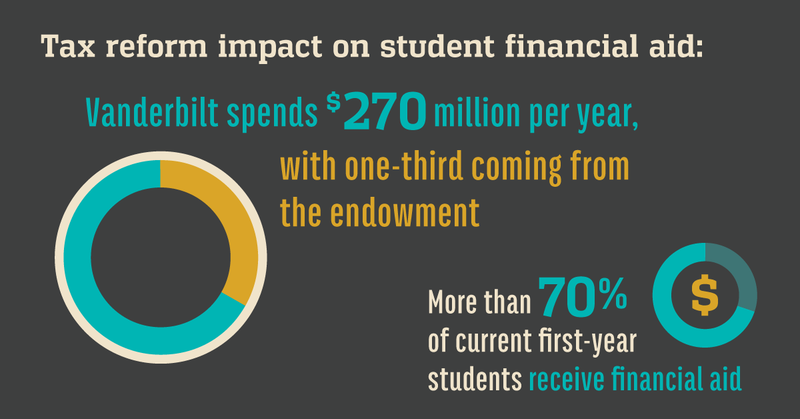 Vanderbilt, for example, spends $270 million on student financial aid each year, of which the endowment funded one third. “In addition, doubling the standard deduction effectively eliminates the charitable deduction for a significant number of taxpayers, undermining charitable giving to nonprofit organizations such as Vanderbilt, which rely on donors to support education and research. At Vanderbilt, donors have provided more than $275 million for undergraduate scholarship since 2009. Still other provisions will change the way the University operates, likely increasing our costs and directing resources away from important priorities such as student aid. “In other words, crucial scholarship and research dollars will now go to the US Treasury instead of benefiting students and society. “Critically, the potential long-term impact this legislation will have on America’s future prosperity is concerning. We must continue to invest in important priorities including cutting-edge and life-saving research. Congress must recommit to the productive partnership between the federal government and America’s research universities, a partnership that has historically received bipartisan support. “We fully support efforts to provide relief to the middle class through simplifying our complicated tax code and stimulating our economy, but we do not think it is in our nation’s best interest to do so on the backs of students. The current House bill is misguided and would ultimately slash key educational resources such as financial aid and diminish a key driver of our country’s economic prowess and competitiveness – our colleges and universities. The current House bill is misguided and would ultimately slash key educational resources such as financial aid and diminish a key driver of our country’s economic prowess and competitiveness – our colleges and universities. “For Vanderbilt, the proposed bill’s significant and profound impacts on our students, families and workforce would fundamentally threaten our ability to carry out our mission. 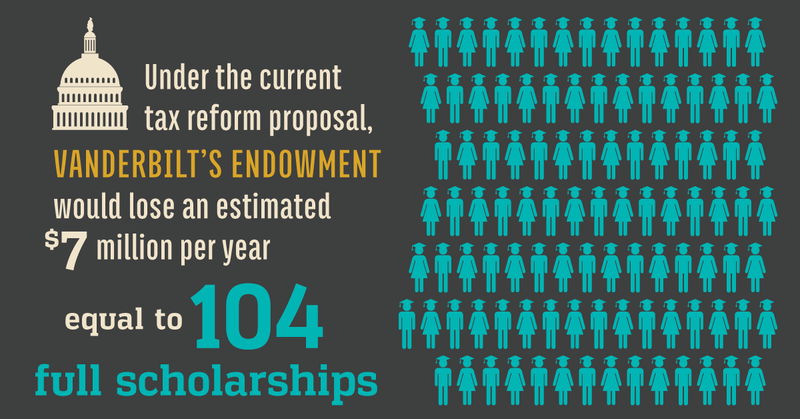 They also would increase the cost of higher education for students and families and threaten Opportunity Vanderbilt, our undergraduate financial aid program that meets 100 percent of a student’s financial need with a package that does not include loans. This is unacceptable. “The proposed excise tax on certain university endowments is a damaging provision that would tax donor funds, make college more expensive, and reduce support for academic programs and research. Under the proposal, Vanderbilt’s endowment would lose an estimated $7 million a year – the equivalent of supporting about 104 students on full cost-of-attendance scholarships.